For Carers, Family and Friends - Connect, Coordinate and Energise Support for the Seriously Ill. Personal and Secure Websites, for Difficult and Tough Times. Save time and reduce stress by posting an update - No need to repeat things again and again. It can be difficult to know how best to help out when someone is seriously ill. As a primary carer, whether professional, family or friend, others need to understand what’s going on to be able to better help. So why not help each other out by starting or joining a Circle. 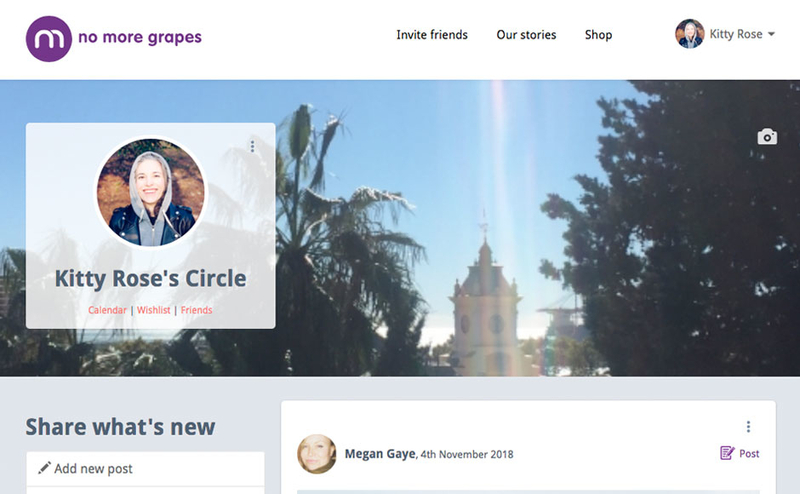 nomoregrapes is a kind of social network where people can share thoughts, ideas, learning and information. Remember, you are not alone. Do you Know the Best Ways to Give Support? What many people don’t know (and why would they?) is that there’s an etiquette in relationships between people with an illness and the people around them—those small ways to communicate, ask questions and provide the kind of support that is really wanted. nomoregrapes makes it easier for people to be helpful to one another, for the important things to be shared and for support to be given where and when it’s best. nomoregrapes brings together those people who want to be counted on for the long haul, with those people who need them there. It’s where little acts of kindness will always be shining moments during some very challenging times. So you can check in to a Calendar, send a quick note or ensure that a given gift will be one that’s welcomed and appreciated when you choose it from a Wish List. Create a private Circle, like a social network, of close Family and Friends who want to help and support. Circles provide a secure place to coordinate support without fuss, freeing up time and reducing stress. The Calendar highlights when practical support is needed, such as people coming around, delivering meals, childcare and arranging transportation. Our Shop enables people to give a treat or something incredibly helpful, whether they are close by or far away. nomoregrapes is a Private and Secure Website, free from any advertisements. Data will remain with us and will never be sold to third parties. Our Purpose is to help those who are caring for the seriously ill by saving time, reducing stress and engaging a wider support network.